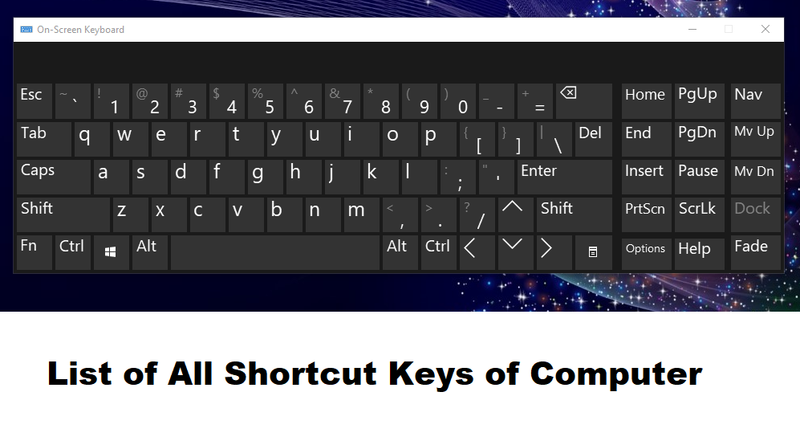 List of all shortcut keys of computer from A to Z. 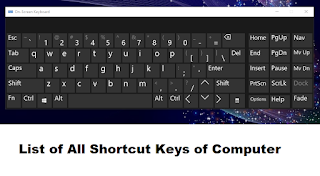 Today I am coming with list of all the shortcut keys that can be used in computers to perform an individual task. CTRL (C) + A - This key is used to select all the content. C + B - Used to bold a text. C + C - To copy anything. C + F - To search or find something in pdf or webpage. C + I - It helps to italic the words. C+ J - It helps in align the text from both side, you can also say justify the text. C + L - It helps in align the text towards left side. C + N - To create new fresh documents or file. C + O - To open existing documents or file. C + P - Helps in printing of any file or documents. C + R - It helps in align the text towards right side. C + S - Helps to save or preserve the documents or files for next use. C + T - Uses to open new tab on browser. C + U - Helps to underline the text. C + V - It helps to paste the text or anything that is cutted or copied. C + X - It helps to cut the text or anything and allow to move the text or anything. C + Y - This is used to redo. C + Z - It has amazing work. It undo the commands. So friends this is the list of some shortcut keys. I will also add some more details in this article. So keep continue with us.